While I applaud anyone who donates money and/or time to charities, some deserve more applause than others do. Since the presidential campaign season has begun, and with federal tax returns due earlier this week, The Washington Post has reviewed the charitable giving of the 2020 presidential candidates who have released their federal tax returns so far. Beto O’Rourke donated $1,166, 0.3 percent of AGI. Kamala Harris donated $27,259, 1.4 percent of AGI. Kirsten Gillibrand donated $3,750, 1.75 percent of AGI. Amy Klobuchar donated $6,602, 1.85 percent of AGI. Bernie Sanders donated $18,950, 3.4 percent of AGI. Jay Inslee donated $8,295, 4.0 percent of AGI. Elizabeth Warren donated $50,128, 5.5 percent of AGI. Was the Trump Foundation the Only Funder on Santa’s Naughty List? As you struggled to raise more money at the close of 2018 while carving out holiday time with loved ones, you might have missed an important news story. On Dec. 18, news reports announced that the New York Attorney General’s Office and the Trump Foundation had reached an agreement to dissolve the Foundation. Under the terms of the deal, the NY Attorney General will distribute the Foundation’s remaining assets to charities. However, the closing of the Trump Foundation does not end the matter. Barbara Underwood, the NY Attorney General, says the state still seeks $2.8 million in restitution, plus additional penalties. Furthermore, the Attorney General is asking the court to bar Donald Trump from serving with nonprofit organizations in New York for 10 years. The state’s lawsuit also calls for a one-year ban for three of Trump’s children — Don Jr., Ivanka, and Eric — all of whom were Trump Foundation board members. The State of New York “lawsuit says that Trump’s charitable organization, which he founded in 1987, engaged in ‘persistently illegal conduct’ and that Trump basically used the Foundation as a slush fund to promote his business and political campaign,” according to a report in Vox. This news item is inherently important. It involves a charitable foundation with significant assets that appears to have acted far less than charitably. It also involves the President of the United States. However, the significance of this story does not end there. If the NY Attorney General is correct about the alleged misdeeds of the Trump Foundation, dissolution of the Foundation and a temporary prohibition of Trump family members from serving with NY charities for a limited time seem like an insignificant punishment. Unless serious penalties are levied against Donald Trump and his family members who were involved, the Trumps alleged criminal behavior will go unpunished. Furthermore, they will remain free to create and/or serve with nonprofit organizations outside of the State of New York. Other than a bit of bad press, the Trumps will pay little for their behavior. The problem does not end there. Failure to hold the Trumps personally liable not only fails to punish the Trump family, it sends a signal to anyone interested in using a charitable foundation for personal benefit. That signal is that there is little downside for misbehavior. In other words, there will be little to no deterrent effect unless severe penalties are imposed by the court, assuming the allegations are proven true. The other thing we need to understand about the Trump Foundation story is that it is not an isolated situation. A decade into my fundraising career, the nonprofit sector was rocked by the scandal surrounding the Foundation for New Era Philanthropy. Operating from 1989 to 1995, the Foundation raised over $500 million in an elaborate Ponzi Scheme that defrauded well known charities and experienced philanthropists out of millions. That wasn’t the first funder scandal, and it certainly wasn’t the last. Let’s face it. The Trump Foundation is not the only funder on Santa’s naughty list. Do you understand what the word “philanthropy” really means? If you don’t, it could be costing your nonprofit organization a fortune in lost support. Conversely, once you know the true meaning of “philanthropy,” you’ll be better able to relate to prospective donors and inspire them to give. So, what does the word truly mean? If you’re like most people, you probably think you know what “philanthropy” means. “Philanthropy” involves a large contribution to a nonprofit organization from a wealthy individual, a philanthropist. A recent example of this would be Michael Bloomberg’s recent announcement that he is donating $1.8 billion to Johns Hopkins University, the largest individual donation ever made to a single university. 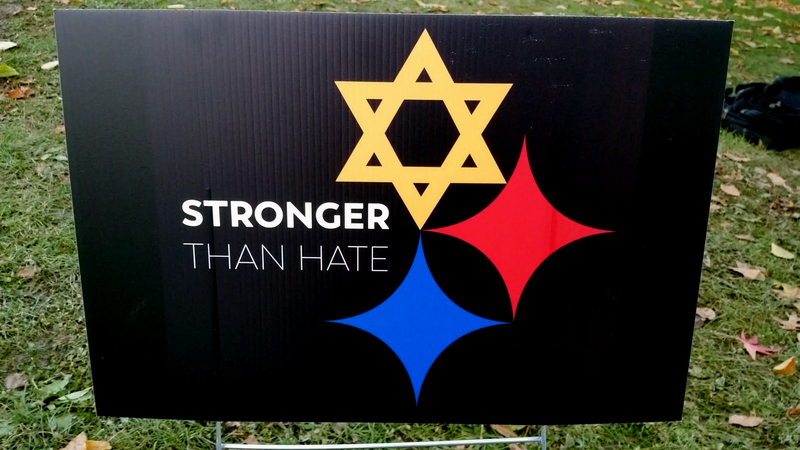 Signs of support appeared throughout Pittsburgh following the murders at Tree of Life * Or L’Simcha Congregation. Think about that. People donate their time and money to nonprofit organizations because of their love of humanity (or animals). They want to solve problems and alleviate suffering. They want to make the world a better place. That’s what motivates people to think philanthropically. People won’t think philanthropically simply because it’s Giving Tuesday, and you tell them they should. They won’t think philanthropically just because they attended your university and are told they should “give back.” They won’t think philanthropically just because your organization exists and is a household name. If you tap into a person’s love of humanity, you’ll tap into their philanthropic spirit. That’s how you’ll inspire their support. That’s how you’ll upgrade their support. That’s how you’ll maintain their support. Charitable giving is an expression of a donor’s love. I was reminded recently of the true power of the philanthropic spirit. It wasn’t Bloomberg’s massive gift, though that was definitely amazing. Instead, when I visited Pittsburgh, I was reminded of the power of love to build, and rebuild, strong communities. Temporary memorial outside of Tree of Life * Or L’Simcha Congregation. 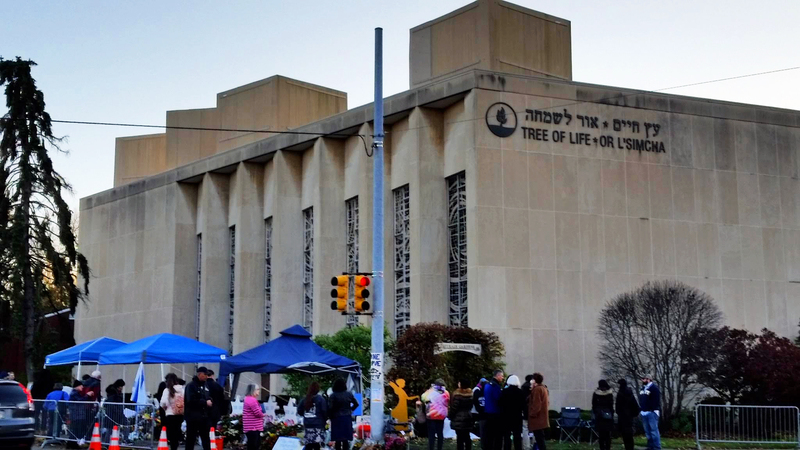 When my wife and I traveled to Pittsburgh a couple of weeks ago, we attended evening Sabbath services with the congregants of the Tree of Life * Or L’Simcha Congregation in their temporary home. This was less than two weeks after a gunman entered the synagogue and horrifically murdered 11 people as they worshiped. Praying with the congregants, talking with them, and meeting Rabbi Hazzan Jeffrey Myers was a profoundly moving experience. Making the evening even more moving was the fact that it fell on the 80th anniversary of Kristallnacht, also known as the Night of Broken Glass. During Kristallnacht in Nazi Germany, Jews were murdered and synagogues and Jewish-owned businesses were vandalized and had their windows smashed. Support came from around the world. Rabbi Myers drew a parallel between Kristallnacht and the recent attack that nearly took his life. Both violent attacks were motivated by rabid anti-Semitism, which has been on the rise in America since 2014. However, Rabbi Myers also drew meaningful distinctions between the two events. During Kristallnacht, officially sanctioned groups along with German civilians attacked the Jewish population. Local authorities did nothing to stop the attacks. The police protected non-Jewish citizens while arresting and imprisoning Jewish victims. By contrast, American authorities condemned the Pittsburgh attack immediately, and offered comfort to the victims. 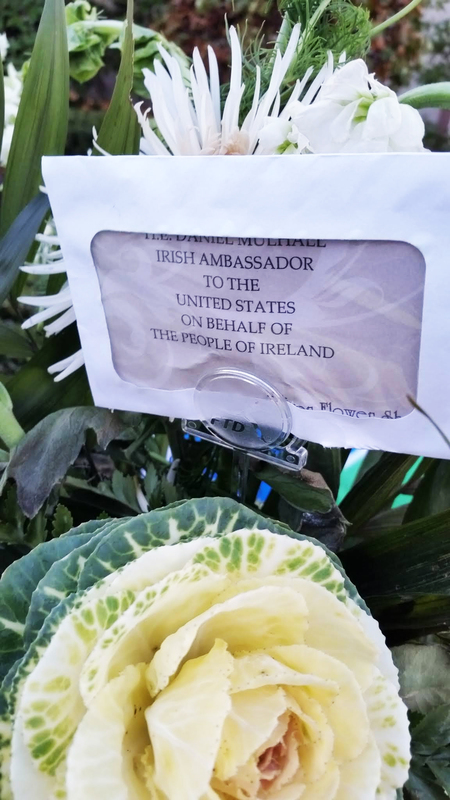 People throughout Pittsburgh, Pennsylvania, the United States, and the world expressed their sense of horror and grief. They offered words of condolence, and made donations to help the families and to rebuild the badly damaged synagogue. The police in Pittsburgh ran toward the danger, put their own lives at risk, confronted the attacker, and ended what could have been an even more tragic event. Did the Midterm Elections Help or Hurt Your Nonprofit? I’m a news junkie. So, I was up very late on election night, actually very early the next morning. Now that I’ve caught up on some sleep, I’ve been thinking about what the midterm election means to charities. In this post, I’ll layout some of my nonpartisan thinking. Just be warned, I’m also going to share some statistics and a bit of history as we consider what the election means for the nonprofit sector. The midterm elections this week resulted in the Democratic Party regaining control of the US House of Representatives. Let’s put that into a bit of historical perspective. Despite successfully securing a majority in the House, the Democratic Party’s much-hoped-for Blue Wave did not materialize. As I write this post, the Democrats are expected to gain a 27 to 34 seat advantage over Republicans in the House. However, Republicans not only hung on to control of the Senate, they actually enhanced their position by three to five seats. To put the Federal election results into some context, let’s look at the 2010 midterm elections during President Barack Obama’s second year in office. Going into the 2010 election, Obama’s approval rating was six points higher than Trump’s was prior to the 2018 election. Nevertheless, Democrats lost 63 House seats and lost six Senate seats. This all means that both Democrats and Republicans can declare success this week. But, what about the nonprofit sector? In Massachusetts, the American Civil Liberties Union, Human Rights Campaign, MassEquality, Planned Parenthood Advocacy Fund of Massachusetts, The Yes on 3 Campaign, and other organizations joined forces and scored a massive victory on election night when voters, by a two-to-one margin, reaffirmed the rights of transgender people. In North Carolina, voters approved a measure directing the legislature to amend the state constitution to guarantee the right of citizens to hunt and fish. This was a victory for the Congressional Sportsmen’s Foundation and the National Rifle Association. In Florida, the Humane Society of the United States and PETA persuaded voters to change the state constitution to ban greyhound racing. Nonprofit organizations have political power. When nonprofit organizations join forces, they can have a dramatic effect on public policy. 2. Good News for the Stock Market. Historically, Americans prefer divided government, so it’s not surprising that Democrats were able to regain control of the House. Like the populace, the stock market also prefers divided government. If the stock market goes up, many donors will own appreciated stocks that they can donate to charities. Foundations will see their stock holdings grow and, therefore, have more money to grant to nonprofits. That would be good news for investors and charities. What is the Most Important Thing You Can Learn from Recent Nonprofit Scandals? Recent incidents at Michigan State University, The Ohio State University, Oxfam Great Britain, The Presidents Club Charitable Trust, Silicon Valley Community Foundation, and elsewhere remind us that the nonprofit sector is not immune to wrongdoing and scandal. If you’ve never worked for a charity reeling from scandal, there’s a good chance you will one day. Even if you don’t work directly for a scandalized charity, you could still be affected by a loss of public trust if a similar nonprofit finds itself under the spotlight for misdeeds. For those reasons, it is essential that you learn the most important thing about how to survive a scandal. 1. Self-inflicted scandals beyond your control. Here’s an example of a situation that was beyond the control of fundraising staff. Oxfam Great Britain was banned from operating in Haiti and the organization’s country director was forced to resign following allegations of inappropriate sexual behavior. Four other employees were fired for “gross misconduct.” While the frontline fundraising staff was not at all involved in the scandal itself, they nevertheless had to deal with the aftermath. 2. Self-inflicted scandals you could have avoided. We saw this when the Ohio Attorney General’s Office accused the charity Cops for Kids of defrauding donors of $4.2 million. Of all the money it raised over a 10-year-period, the charity spent less than two percent on charitable programming. This scandal allegedly involved fundraising staff as well as senior staff engaging in fraudulent behavior. The solution to this type of scandal is simple: Do not misbehave. Obey the law and adhere to the Association of Fundraising Professionals Code of Ethical Standards, the International Statement of Ethical Principles in Fundraising, and/or your nation’s own fundraising code of ethics. 3. Guilt-by-similarity scandal. People in Scotland experienced this several years ago. A cancer charity was embroiled in a well-publicized scandal. As expected, that charity saw a sharp decline in contributions. However, there was also an unpleasant, broad side effect. Completely unaffiliated cancer charities in Scotland also experienced a deep drop in donations resulting from broad public mistrust of all cancer charities. It took the innocent charities nearly a year to recover even with a coordinated campaign to restore public confidence. Other than avoiding problems in the first place, always a good idea, what can you and your organization do to ensure it can survive a crisis or scandal? The answer is simple, though the execution is not: Build strong relationships with donors. It takes effort, financial resources, and time. However, it’s an investment well worth making. Recently, a reporter for The Columbus Dispatch contacted me. Rob Oller sought my commentary about the scandal involving Urban Meyer, The Ohio State University football coach. You can read about the situation on your own since there’s no need for me to get into the details here. Suffice to say that the coach has received a three-game suspension, but not before Bob Evans Restaurants withdrew its corporate sponsorship of Ohio State football. It is with sadness, Jerold Panas, Linzy & Partners announce that Jerry Panas, Founder of Jerold Panas, Linzy & Partners and long time Chief Executive Partner died quietly in his sleep, Saturday, July 14, 2018. Jerry Linzy, Executive Partner, Emeritus will serve as Interim Chief Executive. Business will continue as usual. All questions should be directed to Jerry Linzy, jerrylinzy@panaslinzy.com., or by calling 312.961.3221. Felicity and the family want to express their appreciation for all who have been a Friend of Jerry. A complete biography of Jerry Panas’ life and his vast contribution to the world of philanthropy will be forthcoming. Since Panas started it in 1968, his consulting firm has served over 3,800 clients around the world. Panas wrote 20 books including such classics as ASKING, Mega Gifts, and Born to Raise. He also shared his knowledge in countless professional presentations. 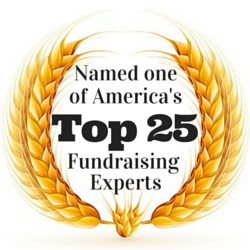 By directly helping charities to raise more money and by educating fundraising professionals, Panas has touched the lives, both directly and indirectly, of countless people around the globe. His impact on the nonprofit sector and on the lives of people in general has been profound. Now, before I illustrate the value of that question by reflecting on some news stories, I must warn you that the following examples include vulgar language. If you want to bypass the examples, you can skip down to the next boldfaced sentence several paragraphs below. What was De Niro’s objective? If he wanted the approval and praise of the Tony audience, he succeeded when his remarks received a standing ovation. However, if he wanted to convince some Trump supporters or independent voters to support the political positions of the Democratic Party rather than President Donald Trump, I doubt he moved anyone. To the contrary; he may have actually strengthened their resolve. What was Wolf’s objective? If she wanted to solidify her base of liberal viewers, I suspect she might have succeeded. With the publicity she received for her comment, she may have even attracted some new viewers who share her liberal views. However, if she wants to use her humor to change the political policies of the Trump Administration or to drive independent voters to support Democratic Party candidates and positions, she probably failed. Whether you’re pro-Trump or anti-Trump is not the issue. What the two examples above demonstrate is the importance of defining objectives. If De Niro and Wolf wanted to diminish Trump’s political support – and I recognize that might not have been their objective — they flopped even as their fans cheered and laughed. Let me explain. In 2016, I participated in a focus group involving independent voters. It was clear that personal attacks on Trump led many participants to be more likely to support him. By contrast, discussion of specific issues led people to thoughtfully consider which candidate better aligned with their own thinking. Based on my experience with the focus group, I wasn’t surprised when I looked at recent poll numbers. Despite recent harsh comments by De Niro, Wolf, and countless others in recent weeks, the RealClear Politics polling average shows that Trump’s disapproval rating continues to oscillate just above 50 percent, where it has been consistently since March 15, 2017. With this post, I want to thank you and share some practical information about plagiarism. Last week, I revealed how I was the victim of plagiarism. Someone lifted a portion of one of my recent blog posts, altered the intention of my words, and purposely misattributed them to someone else in an article he wrote attacking the Association of Fundraising Professionals. Now, I would like to thank you and everyone who supported me with blog comments, tweets, emails, and phone calls. Professionally speaking, the support confirms that my confidence in our profession is well placed. Personally speaking, the support warmed my heart and let me know that I am not alone. At times, such as in last week’s example, plagiarism is an intentional act. At other times, plagiarism is accidental. Are Donors the Hidden Enemies of Charities? 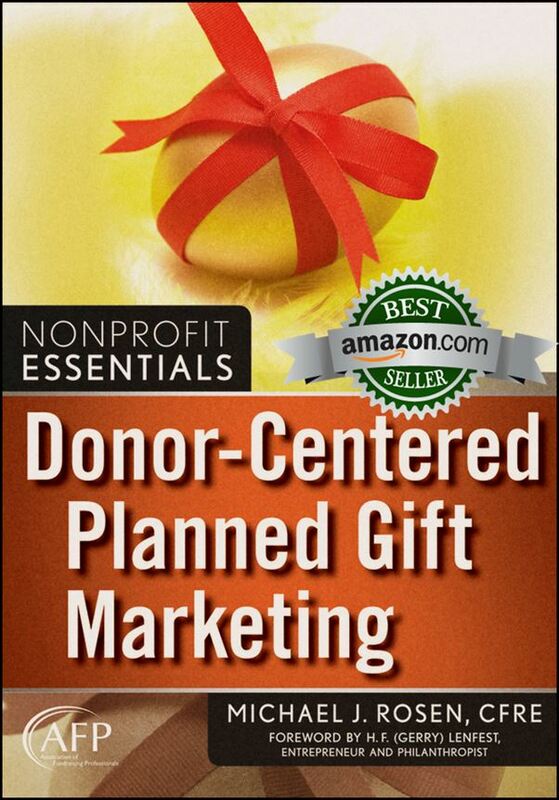 Donors are not usually the enemies of nonprofit organizations. Instead, they are the friends who provide much needed resources allowing charities to save lives and enhance the quality of those lives. However, some donors at some times do become the enemy of the good. They behave in ways that humiliate and, at times, even endanger those with less power. That’s one of the disturbing findings of a new survey report sponsored by the Association of Fundraising Professionals and The Chronicle of Philanthropy and produced by Harris Polling. Among nonprofit professionals surveyed, 25 percent of women and 7 percent of men say they have been sexually harassed. Of the harassment incidents cited, 65 percent of the perpetrators were donors with the balance being colleagues, work supervisors, and organization executives. Harassers are most often men (96 percent). The median number of sexual harassment occurrences personally experienced by survey respondents is three (which is why some of the statistics in the report add up the way they do). The most common types of sexual harassment experienced in the fundraising profession include: inappropriate comments of a sexual nature (80 percent), unwelcome sexual advances and requests for sexual favors (62 percent), and unwanted touching or physical contact (55 percent).